← You’re invited to Drink.Think NYC– 12/3 at Jimmy’s No. 43! The crowd in the back room at Jimmy’s No. 43 is standing room only, guests craning their necks and cupping their ears for a better listen. 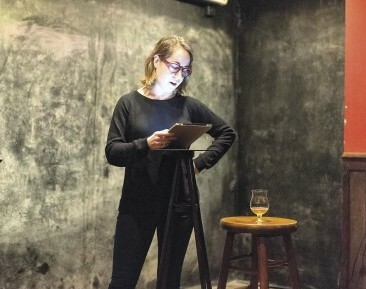 Judging from the turnout, you’d think this town has been parched for a more spirited spoken word—a place where people who write about drinks for a living can read aloud to their boozy muse…. …These people make their living from print, but when it comes to sharing stories, there’s one place that beats any magazine: bars. And Newman’s suspicion that her fellow writers had more than Top 10 Bourbon lists up their sleeves was correct. The original stories read aloud at Drink.Think range from humor to heartbreak, all through the slightly fuzzy lens of alcohol: tales of going on the wagon, discovering deep-rooted vines or booze-fueled college buddies who believe they can do anything. Loss, love and liquor, spilling forth from the page. Thank you, Edible Manhattan and Drink.Think participant Amy Zavatto for this touching tribute. I’m raising a glass in your direction today. This entry was posted in Uncategorized and tagged Drink.Think, Edible Manhattan. Bookmark the permalink.